Warren Thompson, 71, has died, after an extended battle with Alzheimer’s disease. A longtime resident of Redwood City, Thompson passed away at 11:00 A.M. on the morning of Wednesday, March 20, 2013, at a senior care facility in Belmont, California. A generational shift is occurring in the Sasquatch/Bigfoot field. Let us pause for a moment to appreciate what is happening. After the “founding” phase of “Bigfootery,” a new group of Bigfooters arose. One such group organized themselves into the Bay Area Group (BAG), so named because of their location in the San Francisco Bay area. In 1974, I first met one of their founders, the spokesman, the gentlemanly George Haas, at his Oakland, California, home, and returned often, into 1975, to visit with him. 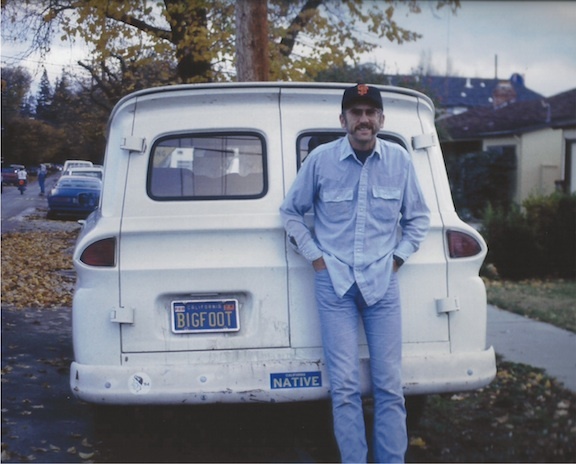 Haas lived in a little apartment full of hundreds of books and artifacts from his years of interest in Bigfoot. Haas’s files included over 3000 news items, and specialized collectibles on Sasquatch, such as rocks used by the creatures in stacked piles. During one visit, I met Archie Buckley, recognized as the group’s co-founder. Several people were connected to the loose organization from the beginning. 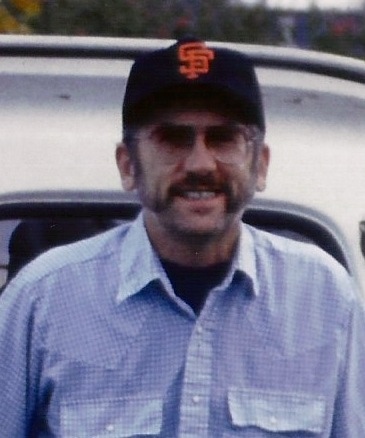 Jim McClarin, well-known today for his appearance in the Patterson-Gimlin recreation film taken by John Green, occasionally met with the group and became associated with them. It was through Haas that I met McClarin. Another early quieter, worker bee member was Warren Thompson, whom I grew to know too, and kept in touch with through detailed correspondences. Other early BAG members included Sharon Gorden, Richard Foster, Ben E. Foster, Jr, and Joel Hurd. Others included Ray Pierotti, Steve Sanders, Mike Ward. The seven original members were Haas, Buckley, Pierotti, Sanders, Ward, Hurd, and Thompson. 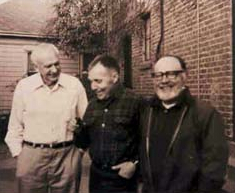 Haas, Buckley, Thompson and their colleagues were opponents of killing Bigfoot, perhaps reflective, in a fashion, of the peace movement ongoing throughout the Berkeley-Oakland area at the time. 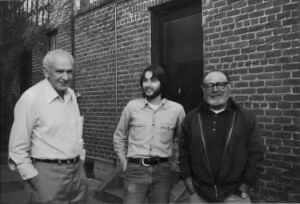 George Haas, René Dahinden, and Archie Buckley, photographed by Loren Coleman, Oakland, California, 1975. George Haas, Loren Coleman, and Archie Buckley, photographed by René Dahinden, Oakland, California, 1975. René Dahinden, Loren Coleman, and many others made the trek to the iconic Jim McClarin redwood Bigfoot in Willow Creek. 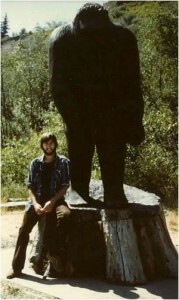 It was the location in the 1970s that Bigfooters had to visit for a photo. Warren Thompson, at the sculpture during the 1970s. Members of the BAG had several close encounters with Bigfoot at an undisclosed location in the Shasta-Trinity area, during the late 1960s and early 1970s. The site where the group’s initial good sightings had occurred, where peanut butter sandwiches had been taken, and where an antenna had been broken off a vehicle was shared with me. I would camp there over a period of days, with no repeat encounters. I was only a few years younger (as was McClain) than most of the BAG members, but Haas, Buckley, and Thompson definitely had a friendly mentorship role to many people who are still in the field. George Haas, 72, died February 22, 1978 (before the In Search Of broadcast). Archie Buckley, just two months short of turning 90, died on June 18, 2007, (see Buckley obit). Now Thompson is gone. That’s sad. Archie Buckley was a member of the Greatest Generation. Thompson was a member of the Silent Generation. “Silent Generation” is a label for the generation of Americans born from 1925–1942, notably during the Great Depression and World War II. The group’s fame derived from Haas’ widely distributed newsletter, The Bigfoot Bulletin, which was first issued on January 2, 1969. See a sample of the newsletter’s discussion of pounding rock. McClarin produced a two-year Manimals Newsletter and Thompson kept a news exchange (The Bigfoot Bibliography) going between Bigfoot researcher, via the mails, for a few years. But Haas’ efforts were missed, and the BAG’s influence slowly lessened, it would seem. But had it? In the 1970s, the central role of the group in Bigfoot studies was so significant that the NBC series In Search Of did an entire episode focussed on the Bay Area Group. Warren Thompson was one of the BAG members profiled on that program. In Season Three of In Search Of with Leonard Nimoy, Warren appeared with his fellow BAG Bigfooters, in Episode #57, entitled “Monster Hunters,” first aired on November 9, 1978. Many modern Bigfooters point back to Haas, Buckley, and Thompson as having drawn them into the field, or certainly being great friends from those days. Warren Thompson (October 9, 1941 – March 20, 2013). This photograph was taken Thanksgiving 1985, © Daniel Perez, 2013. Used by permission. Daniel Perez, editor of The Bigfoot Times, shared some key points of the fieldwork and thoughts that Warren conducted. 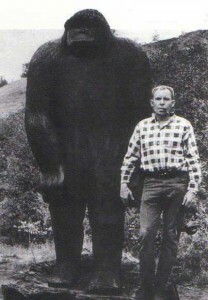 ~ Warren Thompson went to the Patterson-Gimlin Bigfoot filmsite on a motorcycle in 1968, hoping to see a Bigfoot. He did not, and never did. ~ Rene Dahinden and Warren visited the P-G site together, several times. ~ Archie Buckley and Warren would investigate the Basin Gulch, California area, a well-known spot of Bigfoot track finds, on many visits. Several individuals are sending their condolences around the web, regarding the loss of Warren Thompson to each other via email, tweets, forums, and other electronic means. Warren came from an earlier era, but his impact has ripples into this e-age with newer members of the community searching for Sasquatch and trying to find Bigfoot in the same fashion that Warren did. His legacy lives on. Goodbye, Warren. You will be missed. Thanks to Larry Lund and Daniel Perez for the initial news about Warren’s death. My appreciation to Chris Murphy for pointing out the proper Generation in which Thompson lived. H/T to Perez for his critique driving me to enhance my notes on the history of BAG founders. Met Warren several times in the early ’90s. One of the nicer Bigfooters I’ve ever met. RIP.